For the fourth consecutive year, the U.S. was home to the fastest-growing wind power market in the world in 2008, capturing roughly 30% of the market. 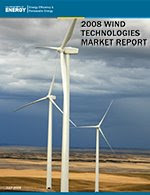 U.S. wind power capacity additions increased by 60 percent in 2008, representing a $16 billion investment in new wind projects. Wind projects accounted for 42% of all new electric generating capacity added in the U.S. in 2008 and wind now delivers nearly 2% of the nation's electricity supply.